Since its premiere in October 2014, there has been more than a little debate about whether or not Interstellar is a “religious” film. 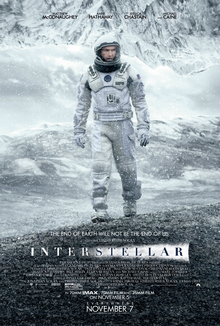 Catholic film critic Steven Greydanus claims that, for all of its metaphysical interests, Interstellar never really addresses the question of God — an omission that he contrasts with Alfonso Cuarón’s Gravity (2013), another sci-fi film that clearly broaches religious themes as it braces for its dénoument. And yet, Christianity Today’s Alissa Wilkinson calls Interstellar an “inescapably (r)eligious film,” as does Megan Garber of The Atlantic, who considers it an exploration into “the spiritual implications of space.” What gives? Part of the issue, doubtless, has to do with what counts as “religious” in today’s increasingly secular culture. For, as Wilkinson and Garber note, the very plot of Interstellar bears concerns that can’t help but raise questions about the destiny of human beings and the role of the supernatural therein. Matthew McConaughey plays Joseph “Coop” Cooper, an astronaut and scientist, who is led by a series of uncanny experiences to a secret NASA plant. There he learns that the crop blight plaguing the Earth will not abate and that he is to head an expedition to a wormhole near Saturn, where, it is hoped, he will find a new planet for the Earth’s population or, at the very least, a place where several thousand human embryos can be raised and the human race preserved. Preceding him in this endeavor are twelve other persons, and, while a number of them are presumed dead, three have sent back encouraging feedback about planets near a black hole, Gargantua. Though torn — Coop is leaving behind a family, including his intelligent yet fragile young daughter, Murph — he agrees to lead the mission and leaves with a small crew of scientists and robots. The journey to the wormhole alone will take roughly two dozen years in Earth time, and Coop is unsure if he’ll ever see his family again. The biblical texts are to be read in their context, with an appropriate hermeneutic, recognizing that they tell us to “till and keep” the garden of the world (cf. Gen 2:15). “Tilling” refers to cultivating, ploughing or working, while “keeping” means caring, protecting, overseeing and preserving. This implies a relationship of mutual responsibility between human beings and nature. Each community can take from the bounty of the earth whatever it needs for subsistence, but it also has the duty to protect the earth and to ensure its fruitfulness for coming generations. “The earth is the Lord’s” (Ps 24:1); to him belongs “the earth with all that is within it” (Dt 10:14). Thus God rejects every claim to absolute ownership: “The land shall not be sold in perpetuity, for the land is mine; for you are strangers and sojourners with me” (Lev 25:23). Of course, Francis’ reading is in line with Catholic orthodoxy, to which Nolan need not adhere. And yet, one might wonder just what is lost in the transition from the older, Catholic perspective to Nolan’s more Darwinian approach. If human beings are not, in a certain sense, bound to the Earth, then why should they care for it? Perhaps human development, following the law of evolution, will ultimately transcend what the Earth can provide, and so the planet should simply be stripped of its resources and discarded as a sign of “progress”? This viewpoint is not explicitly stated in Interstellar, but it is telling that, in one scene, Coop laments how human beings have wasted too much time “staring in the dirt,” rather than seeking their place in the stars. Moreover, due to gravitational time dilation, Coop’s experience in space is occurring at a startlingly quick rate in Earth-time. Murph is now an adult, working with NASA to find an equation that might harness gravity. Her efforts have proven unsuccessful, but then something unexpected occurs. Coop plunges his ship into Gargantua, only to emerge into a tesseract wherein he is capable of interacting with multiple dimensions of reality. Thus he is able to transcend spacetime and to communicate with Murph through gravity waves — a discovery that dovetails with the uncanny experiences that inaugurate the film. Eventually, the tesseract collapses and, in a whir of color and light (which suggests Nolan’s fondness for Stanley Kubrick’s 2001: A Space Odyssey) Coop finds himself in a space station orbiting Saturn, where he is reunited with the now elderly Murph. The mission to save humankind has proven successful, but, just as importantly, Coop has been reunited with his daughter. Here, again, Interstellar skirts up against various theological issues. For example, Coop’s ability to outstrip the normal limitations of human nature (finitude, temporality, perhaps even mortality), not to mention his “second coming” at film’s end, suggest godlike status — a point arguably intimated by his initials, J.C. And yet, Coop’s powers are not conferred by a deity, nor are they intrinsic to his nature. Rather, they were bestowed by a future human civilization, which has learned to master the very conditions that burden human beings. In the end, then, Interstellar dares to imagine a humanity that itself has become divine. It is a theme, I suppose, that could be spun in a Christian direction. After all, as Nolan sees it, science itself is not a dispassionate discipline, motivated by objective data and perfunctory inquiry, but is driven by love — love of our children and, if not our planet, then our race. And from where, one might ask, does that love originate? Why, indeed, are we the way we are? Such questions are ripe for theological interpretation, but, as noted at the outset, Nolan doesn’t bite. Just why is a matter of speculation, though it seems safe to say that, for Nolan, it’s far more interesting to think about where humanity is going than where it came from. For when we look to the stars, not as a heavenly abode but as a world to conquer, we are able to save ourselves. And, in this conclusion, Nolan turns science into a religion unto itself.